Termites are a threat to homeowners throughout the Houston area. Once you have a problem, it’s almost impossible to get rid of them without the help of a professional. Your home is an endless food source for termites. 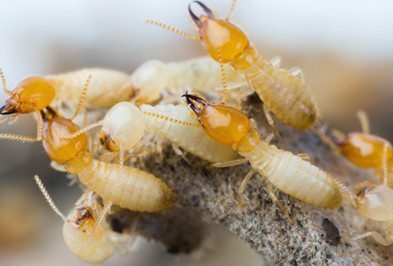 Termites can chew through wood, flooring and even wall paper – anything with cellulose. The scariest part is that most signs of termites go unnoticed until it’s too late and you have a serious issue. Because they are so difficult to eradicate once you have them, your best bet is to take every effort you can to prevent termites before they become a problem. Eliminate moisture by repairing leaky faucets and water lines, both indoors and outdoors. Keep mulch, wood debris, scrap lumber and firewood away from your home, as they are food sources for termites. Grade soil so that water, including AC condensation, runs away from the foundation to avoid adding moisture to your foundation. Turn off outdoor lights at night during swarming season (early spring) and keep doors and windows sealed shut. Repair broken roof tiles/attic entrances – wooden beams in the attic are often exposed and provide a free meal. Remove old tree stumps and treat infested trees on your property. Limit wood to soil contact, including wooden fences that run along your property. Eliminate cardboard boxes in places like the garage and attic, which can be a food source for termites. Routinely check foundation for signs of mud tubes and cracks. Schedule an annual professional inspection. Wood-boring insect damage is not covered by homeowners’ insurance policies, which is why you need a professional service to protect you. Although it’s difficult to know if you have a termite problem, there are a couple of signs you can look for. Check the patterns in wood material to look for paths where termites may have eaten. You can also look for blistering on your walls, soft areas on floors, “kick-out” holes on drywall, and mud tunnels around the foundation, up walls, or on other structures – particularly in crawl spaces. Mud tunnels are the “highways” termites create while moving from the soil to your home. The best way to prevent termites is to routinely check these areas that frequently fall victim to termite infestations. It is also highly recommended that you hire a professional pest control technician to look for places you may not have thought of, take preventative measures to control termites, and eliminate any termites that may be making themselves at home. Contact Holder’s Pest Solution today for your termite control needs.